Like every year, this year too CSSS geared up for the celebration of International Women’s day on 8th March, but with a difference! Unlike the previous years, this year we decided to celebrate the big event in all the units with a three-fold objectives; a) to spread the message of this event more powerfully in villages and sensitize people on gender rights, b) to involve local leaders, politicians and social workers to speak for the women and c) for increased visibility of our work in the units. Nowshera, 8th March: Nowshera unit in Rajouri district was the first to celebrate the event. 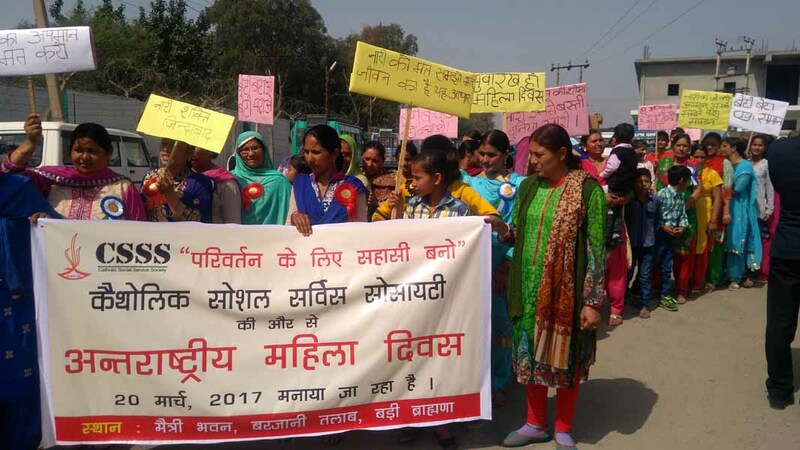 And they did so in association with the legal cell at Nowshera by organizing a massive rally of women who raised their voice against gender discrimination and female infanticide. The rally coordinated by Sr. Ann Joe CMC and her team concluded with celebrations at Dak Bungalow where women entrepreneurs and SHG leaders were felicitated for their contributions towards the society. Mrs. Sandeep Kour, the Sub-Judge and Mr. Harbans Lal Singh, SDM; Chief Guest and Guest of Honour respectively helped women become aware of the legal services which are strictly dedicated towards women’s protection and security. Other guests included Mr. Deshraj, DDM – NABARD; Bank managers, doctors and social workers. 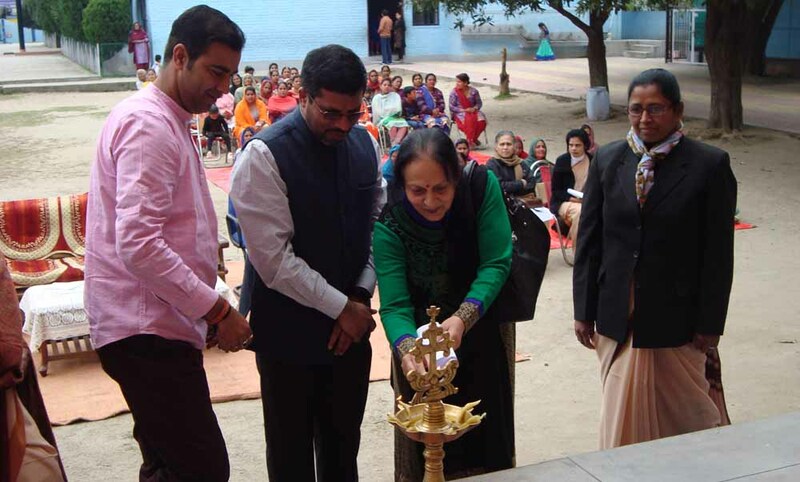 Dansal, 9th March: Women’s health and access to entitlements were the main focus of the celebrations at Dansal where Dr. Shamim, BMO was the Chief Guest of the function. A skit performed by the women highlighted the social realities faced by the women in rural households. It called upon men to create safe spaces for women to grow to full potential. Mr. Angres Singh, the sarpanch applauded the efforts of Sr. Archana in organizing the women in several groups and for giving them training and handholding to help them become financially independent. Dr Shamim gave away certificates to the trainees of Cutting and Tailoring training conducted in the center for six months. Akalpur, 15th March: The celebration of International Women’s Day was themed on “health and legal rights of women” in which 300 women participated from different villages of Akalpur. The programme started with awareness talks on health and legal rights by followed by a well-acted Nukad nataak (street play) that highlighted the social evils in rural communities especially on dowry system and preference for boys over girls. Awareness songs and dances by animators, children and women brought much cheer to the celebrations. Dr. Geeta Kotwal urges the women to take good care of their needs and give priority to hygiene. Mr. Vikash Choudhary, General Secretary of BJP Youth Wing who was the Chief Guest of the day appreciated the efforts taken by CSSS and Sr. Jessy for helping the women socially and economically empowered through the formation of SHGs, skill training and awareness programs. He congratulated the women who were completing their 6-month training in cutting and tailoring. The event was also an occasion for CSSS to honour 5 women leaders for their leadership in SHGs. The program concluded with distribution of 250 saplings of mango and guava to the guests and participants. Smailpur, 20th March: The programme began with a massive rally themed on “Gender discrimination” of more than 300 women which started from Kala gate and culminated at Matri Bhawan followed by the cultural function. At this occasion Shri Surjit Singh Slathia, (Ex minister for industries and commerce) was the chief guest and Ms. Saba Shawl (S.P Prison) was the guest of honour. The program began with welcome note by Sr. Ruby and trailed by speeches on gender equality, women empowerment and domestic violence. While speaking on the occasion Mr. Slathia acknowledged the interventions of CSSS that has brought remarkable positive transformations in the target villages of smailpur unit. Ms. Saba Shawl stressed the need for every woman to assert herself to be heard in this male dominated society. Women entrepreneurs from Smailpur unit also exhibited their self made products like pickles, jam and chutney and sold them during the celebration. Nagri, 6th April: The International Women’s Day was observed as ‘Annual Consultation on financial inclusion’ in which more than 400 women participated from 35 SHGs and women’s groups in Nagri. Fr. Soosai Rajan, the Principal, staff and students supported in organizing the event, which was held at Holy Family Convent School. Cultural programs by women’s groups and students of the school were all themed on – ‘Be bold for change’ to step up the actions for a more gender-neutral world and with the aim to appraise, embolden and promote participation of women in the society. Applauding the efforts of CSSS in taking up issues of women, Ms. Suninder Kour, KAS BDO, Nagri, highlighted the need for strengthening of these groups to take benefit of government schemes. Mr. Satyam Kumar, Manager, Andhra Bank spoke in detail about ways to avail various schemes and how banks can help the groups finance their income generation initiatives.